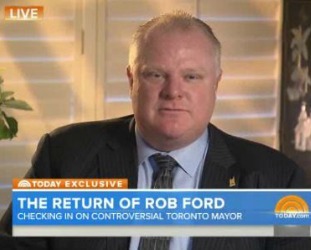 Toronto’s crack Mayor Rob Ford finally gave an interview that wasn’t totally embarrassing. Appearing on the Today show this morning to speak with Matt Lauer three months after vowing to make changes, Ford sat up straight and calmly answered questions about how he’s doing and his plans for the future. In a nutshell, he’s working out and preparing to campaign for another term as mayor with elections taking place on October 27. Despite Ford’s monotone and lack of antics, there are two interesting things about this interview. The first is how labored it is. It’s almost as if not being a buffoon on camera is actually a huge deal for him. He looks as though his handlers really had to pressure him to stick to the script. The lunacy is just itching to burst out and entertain/appall us once more. There are still a couple of mini-gaffes in there. The first, his continued denial about being a substance abuser, which, over recent months was glaringly apparent. And his weird explanation for being caught on camera talking in a Jamaican accent. “I’ve been brought up with a lot of Jamaican friends… I drank” isn’t really much justification for this craziness. The second is the way Matt Lauer handled this interview. Mayor Ford is an easy target and Lauer could’ve hammered him again for the things he’s been caught doing. Instead, he played it straight, asked a couple of uncomfortable questions, and even gave him the chance to show some excitement about the Canadian hockey wins at the Sochi Olympics. Compared to the hopping high fives he did while the game was happening, Mayor Ford was noticeably subdued even here, one more thing that seemed so rehearsed that it flattened the segment. For Lauer, this was a win for his reputation. Bullying a man who’s already been beaten down by his own antics and their coverage in the media would’ve just been cruel. So to answer the question in the headline: Perhaps Mayor Ford would like this to be a maneuver in pursuit of political rehabilitation, but he’s fighting what will likely be a losing battle. He has 34 opponents waiting for the chance to remind us of all the undignified things he’s done during his tenure. His ability to lead was not only hampered by his consumption of both drugs and alcohol, but he’s been stripped of most of his powers. He’s a toothless mayor. Still, February 9, CTV News Toronto reported that 37 percent of the 769 people polled would vote for him (59 percent would not). “Forum Research says Ford’s re-election chances depend on who else joins the race,” the outlet reports. Voters would like more right-leaning options. Now they have them. Two conservatives who are seen as more-than-worthy contenders joined the race yesterday adding to the group that’s already in the race. That may be all it takes.